Cover art for Stephen King’s Revival. I read a tremendous amount of Stephen King as a kid and teenager, but I stopped keeping up with him when he finished the Dark Tower series. I do occasionally venture back to that old well, the most recent time being 2013 when I read Doctor Sleep, the follow-up to his classic ghost story novel The Shining. 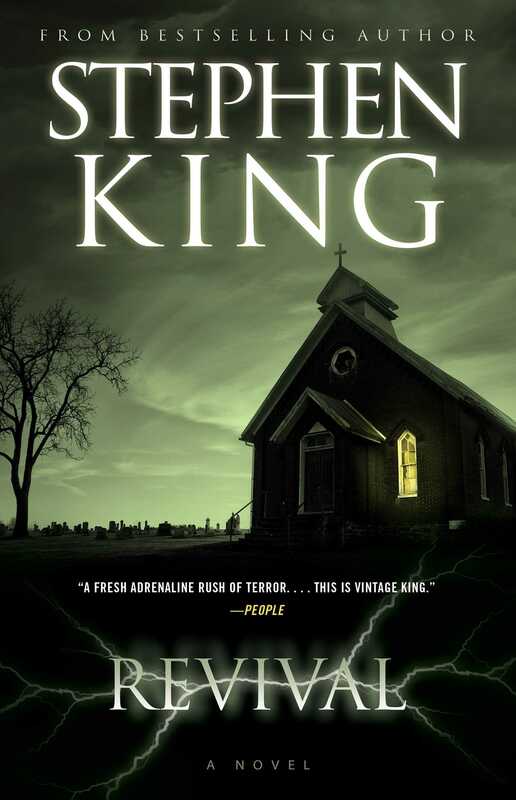 Revival, like Doctor Sleep, is a return to the old-form King of small towns and intimate horror. There’s a growing unease — though only a few moments of true horror — in the first half of the book as Jamie Morton, our protagonist, talks about his “Fifth Business”, a preacher-turned-half-mad-scientist named Charles Jacobs. Jacobs randomly shows up in Jamie Morton’s life, each time more ominously than the last. I’ve been listening to the book during my morning walks, and I’ve found it to be good company. It’s exactly the sort of slow-motion horror novel I like to read before launching into my space opera-filled summer reading list.